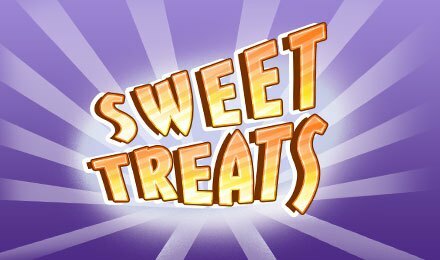 Sweet Treats is a fun-filled instant win game available at Vegas Spins casino. It is beautifully crafted by IWG. It consists of a gameboard on which your aim is to form clusters of matching symbols to win. The game is also packed with bonus features and can reward you with a maximum potential prize of 10,000x your stake. Don’t miss this game at Vegas Spins and load it up on any kind of device! Start by selecting one of the stakes available on Sweet Treats. Next, click on the Play button. The stake value is deducted from your balance when the game starts. Different symbols fall into place on the game board. Your aim is to match 5 or more matching symbols horizontally or vertically to create a Cluster. Remember, diagonal matches do not count. Find clusters to earn payouts which are displayed on the Paytable. The destroyed clusters allow for others to fall in their place. This process continues until no more clusters are left. An AutoPlay feature is also available for you to launch 10, 25, 50, 75 or 100 automated spins. Personalise your gameplay with settings like Number of plays, Loss Limit or Single Win Limit. Want to cancel AutoPlay? Press the Stop button at any point during the game. When a round ends, the wins are displayed on the screen. Amount of Paylines Selection: Paylines are not present. Coin Values: The stake amounts you can select from are £0.10, £0.20, £0.50, £1, £2, £3, £5, £10 and £15. Golden Ticket Bonus: Choose chocolate bars to reveal a prize. Continue opening them until you see “Collect”. All the prizes revealed during the round are then awarded. Sweet Blast Bonus: Clicking on the Draw button reveals a prize amount. Keep on doing so until you land on “Collect”. Next, the revealed prizes are awarded. When 3 or more adjacent Free Go symbols show up, Free Goes are activated on Sweet Treats. During this feature, select a pipe to earn the number of free goes displayed. The free goes then start to play.